Small Language in a Big World: Latvian – To Preserve, Adapt, or Give Up? In a world where the value of the English language as a global social skill is becoming less a skill and increasingly a necessity, how do we convey to our children the importance of learning another, less frequently used language? And, equally pressingly, how do we instill within them the desire to understand and voluntarily use that second language? As the demand for and the convenience of using the English language, both within the US and beyond its borders, continues to grow, many other languages are finding themselves forced into a periphery. It is precisely this issue that the Latvian language faces, and that several organizations within the US are trying to counter. Where in the World. . . ? Latvia, formerly part of the Soviet Union, has a long coastline on the Baltic Sea. First problems first: the Latvian language, and the country of Latvia itself, is one that many people admit they have never heard of. Located on the Baltic Sea and sandwiched between Estonia and Lithuania in Northern Europe, Latvia only established itself as a nation independent of the Soviet Union in 1991. WWII marked the mass exodus of Latvians seeking haven from the war-torn country, many of them resettling in North America, where they integrated into American society, while simultaneously maintaining their Latvian cultural identity. Now, however, two generations later, Latvian-American youths are finding themselves further removed from the Latvian culture, speaking a broken version of the language, and, as a remedy to both these issues, turning to summer camps as a form of heavy Latvian immersion and education. Lina Batarags, a 22-year-old from North Jersey, grew up speaking Latvian at home with her parents and her two brothers. “We went to Latvian school every Saturday up through eighth grade, and every summer, all three of us went to Latvian summer camps, first in the Catskills (in New York), and later on to the Latvian Summer High School in Michigan,” she says. “I had two sets of friends: my friends from school, and my Latvian friends.” Now a college graduate, she is one of the many Latvian-Americans who dedicate their every summer to working at one of several Latvian summer camps across the US. These camps, such as the Latvian Church camp in Elka Park, New York, where she has worked for the past four years, are run exclusively in Latvian. “All the kids, all the counselors, interact only in Latvian. It can be challenging, but it remains the defining feature of the camp.” In addition to acting as one of the places where kids are required to push themselves to regularly use and improve upon their language, the camp also teaches its campers cultural and historical values; educational lectures and lessons in traditional singing and dancing are two landmarks of the everyday schedule. 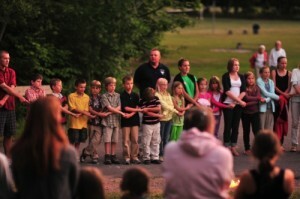 Campers and their counselors link hands into a chain on the first night of camp. 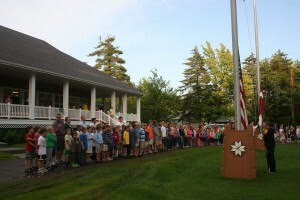 Campers line up for the daily raising of the two flags - Latvian and American. Batarags notes that the Latvian language is developing in several different strains. “In America, most of us speak the ‘old’ language, which our grandparents taught us. It’s quite different from the Latvian currently being spoken in Latvia, where a wider array of Russian and English words is commonly integrated into everyday speaking.” The different developments within the language, primarily geographically based, aptly reflect the different ways the culture is developing in Latvia and abroad, respectively. In this sense, the language tracks major shifts and movements in a culture. “In the US, many of us regard the language as something to be preserved, to be kept as it once was, and purposely try to steer clear of mixing English and Latvian words. But in Latvia itself, which is more concerned with staying globally relevant than it is with staying linguistically ‘pure,’ we see other, widely used languages beginning to infiltrate and to heavily affect the vocabulary.” Each version of the language with its morphing linguistic patterns can be praised and faulted accordingly; undeniably, however, each is as relevant and necessary to its own culture as it is incompatible with its counterpart. 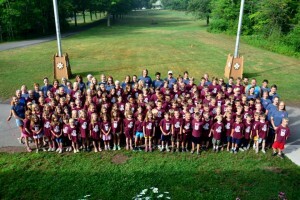 In the summer of 2012, the camp was home to over 100 campers and more than 30 counselors/personnel. Written by Lina Batarags, February 2013. Burgers and Milkshakes and Fries, Oh My! 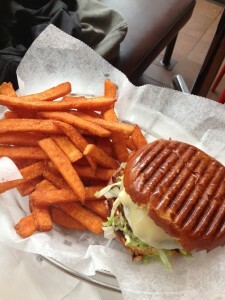 If you’re an avid cheeseburger and fries eater as I am, you’ll love to hear about Burger Creations. 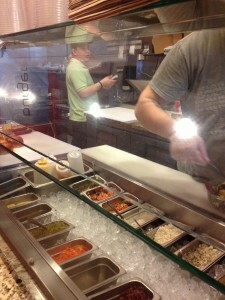 Located at 52 E 8th Street in Manhattan, Burger Creations is in the heart of the NYU area and the college hangout. 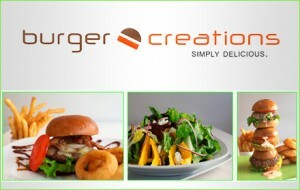 Burger Creations is a clean place with a contemporary look and a laid back atmosphere. With soccer playing on the TV and the Black Eyed Peas playing on the radio, it is easy to feel relaxed and at home. As popular as it is for students, it’s popular also among businessmen and women, particularly around one o’clock when they come for lunch, packing the small establishment. In fact, when I visited around this time with a friend, we decided to come back in an hour so that we could get a place to sit without feeling like we should rush out. Around two o’clock, the hustle and bustle of the lunch hour had subsided and the two of us returned with empty stomachs and high expectations. As hungry as I was, I wasn’t disappointed. With over ten varieties of burgers, including everything from the original cheeseburger to burgers inspired by Japanese and Hawaiian cuisine, there is certainly an array to choose from. Burger Creations also offers a variety of sides: onion rings, regular fries, sweet potato fries, house salad, chicken fingers, and even three varieties of chicken wings! 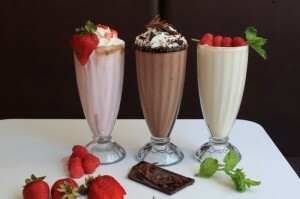 They also serve milkshakes and classic American sandwiches like the BLT. I chose the traditional route to see what Burger Creations could do with the good ole cheeseburger with everything on it, including some avocado and a side of onion rings. If you’re a visual person, then you’ll love to see your burger being made through the glass separating customers and the kitchen. Freshly ground meat from the burgers is seasoned and paired with freshly cut vegetables through quick and friendly service. If you don’t want to peek into the kitchen, then you can rely on your nose as the smell of burgers perfumes the air and wakens your taste buds. 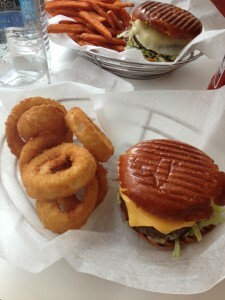 Compared to other burger places, the burgers at Burger Creations might seem small at first. But I left feeling extremely full and surprised at how perfectly portioned my meal was. Deliciously displayed in a pressed brioche bun that doesn’t overpower the burger and its fresh ingredients, my perfectly moist traditional cheeseburger burger was spot-on for any cheeseburger and fries lover. With delivery and catering services available, you can have Burger Creations for your every culinary need. I will for sure come back and take the untraditional route with something from the “Creative Burgers” menu. With the variety of unique burger combinations at Burger Creations, you can’t know what a burger is capable of until you’ve tasted one made by the professionals. These are not your dollar menu burgers, with $7 being a typical price, but you get what you pay for and more: a juicy, seasoned burger made from in-house ground meat and cooked to your liking, a selection of toppings and sides, a bun that does more than just hold it all together, as well as a burger experience your taste buds have never had before. 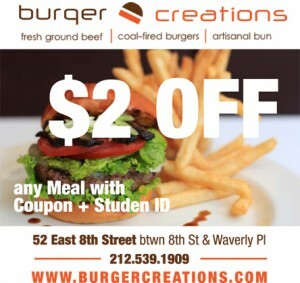 Also, if you’re a student, Burger Creations offers a discount with your student ID, and it accepts NYU Campus Cash. Who can beat that?! Download the coupon below, to receive a student discount for Burger Creations. Olivia Orellano, CCNY Graduate. Check out my Blog!